A SMARTER WAY TO BUILD ON BLOCKCHAIN. Build your decentralized applications with the most powerful blockchain PaaS on the planet. Provide makes blockchain development & deployment extremely fast, affordable and easy to use. Open and extensible to provide choice and future-proof blockchain investments. Code snippets that let you quickly leverage blockchain in your enterprise applications. Configure and deploy to thousands of nodes in just a few minutes with unprecedented scale. Transparency of architecture and broad support of communities to enrich services. Select a testnets, mainnet, or your own network. The Provide Platform supports the most popular blockchain protocols and clients, and lets you choose between public or private networks. We don’t ask developers to change how they build smart contracts. Copy your dApp, assign your signing identity and select any constructors like a an IPFS Gateway you want to deploy for your contract and declare any arguments. Deploy your dApp to hundreds or thousands of nodes in a matter of minutes with the click of a button. Private networks can run on public clouds including Amazon Web Services or Microsoft Azure. Bringing your dApp to life is easier with the right tools. Integrate your blockchain data with your enterprise applications using the language of your choice with a few lines of code. 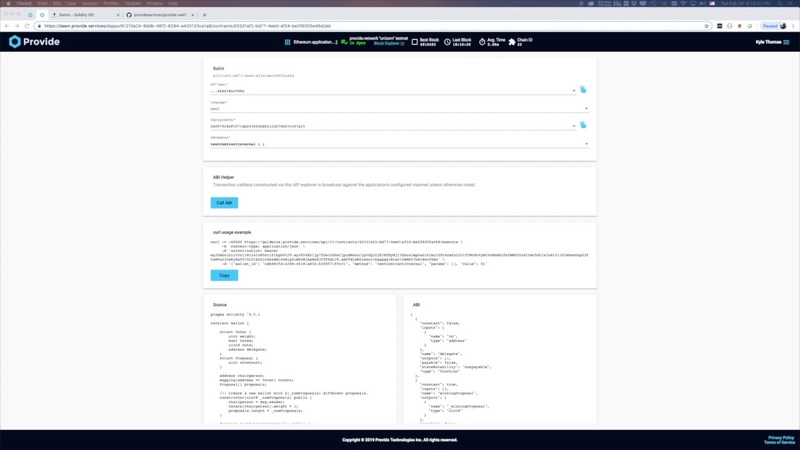 Provide is a scalable, protocol-agnostic platform for deploying and interacting with public or permissioned blockchain networks using a modern developer experience and easy-to-understand APIs. Integrate existing applications or business processes with an efficient, scalable blockchain architecture. Give your development teams the head start they need to become productive developing your decentralized solutions. Deploy a private or permissioned blockchain network for your organization in minutes. "They not only saved me millions of development dollars and a ton of time, they helped me deliver the first scalable solution for my industry." "We are currently working with Provide on a couple of proof-of-concepts and they have the best platform on the market." "Developing against the Provide Network is developer friendly, I would highly recommend checking out Provide before rolling your own." Accelerate your path to blockchain. Try now for free. Cancel anytime. Copyright © 2019 Provide Technologies Inc.